Increasing enrolment rate in elementary education, growing awareness regarding visual arts and government initiatives to improve the quality of education in India are factors that would surge the demand for art stationery products such as crayons, pencil colors and acrylic colors over the next six years. According to 6Wresearch, the India art stationery market size is expected to register a CAGR of 13.8% during 2018-2024. Crayons and pencil colors dominated the Indian art stationery market in 2017 in revenue terms, as these products are primarily used by the school going population of the country. According to U-DISE, more than 210 million students were enrolled in 1.5 million elementary schools of the country in 2016-17. Further, changing career preferences of students from traditional courses to arts and humanities is likely to have a positive impact on the growth of the Indian art stationery market during 2018-24. The government of India is also promoting the expansion of the visual arts industry and several international art auction companies such as Saffronart, Christie, Sotheby and AstaGuru are also expanding their footprint in India. Oil and acrylic colors are expected to capture highest India art stationery market share during the forecast period on account of their increasing demand among professional artists. Further, several companies are also expanding their product portfolio to include more number of fine art stationery products. 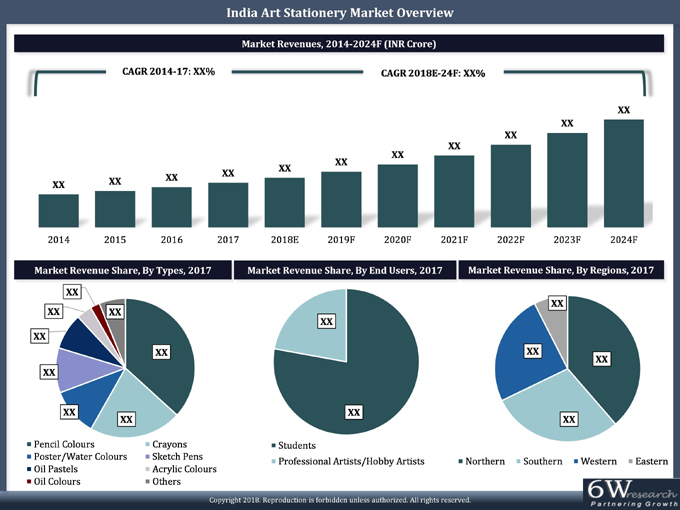 The India art stationery market report comprehensively covers the India Art Stationery Market by types, product types, end users, and regions. The India art stationery market outlook report gives an unbiased and detailed analysis of the India art stationery market trends, opportunities and market drivers that would help stakeholders to design and align their market strategies according to the current and future market dynamics. 12.1. A W Faber Castell (India) Pvt. Ltd.
12.2. DOMS Industries Pvt. Ltd.
12.3. Hindustan Pencils Pvt. Ltd.
12.6. Maped India Stationery Products Pvt. Ltd.
12.9. Shachihata (India) Pvt. Ltd.
12.10. Staedtler Mars Gmbh & Co.